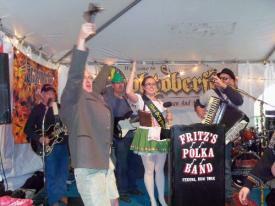 Fritz is shown here during FPB's evening gig on October 15, 2011 at the Brown's Brewing Company Oktoberfest. Frank dances with his friend, Linda Wells, as FPB cranks out 'Austrian Wedding Dance' during their evening gig of October 15th. Gabe with his bass/guitar rig for FPB's evening gig of October 15th. Mike is all smiles as he's pictured here with his Godmother prior to FPB's evening gig on October 15th at Brown's Brewing Company in Troy, NY. Fritz is pictured here with his friends (and former co-workers) Linda Wells and Patty Lutzy prior to FPB's evening gig of October 15th at Brown's Brewing Company. The view from the stage as a jam packed crowd rocks out to music by Fritz's Polka Band at the 2011 Adirondack Pub & Brewery Oktoberfest! Fritz's Polka Band cranks out a tune at the Adirondack Pub & Brewery Oktoberfest during the afternoon of October 15, 2011. Gabe tears through a tune on his six string during FPB's afternoon gig at the Adirondack Pub & Brewery Oktoberfest on October 15th. Tom and Frank are shown here during FPB's afternoon gig of October 15th in Lake George, NY. Tom, Frank, and Fritz are pictured here with John Carr (Adirondack Pub & Brewery owner) and Ms. Dirty Blonde, during FPB's afternoon gig of October 15, 2011. Fritz presents a pair of Jagermeister shorts to the lovely volunteer who danced with Frank during FPB's afternoon gig of October 15th in Lake George, NY. Fritz is pictured here with his friends, The Strevilles, during FPB's afternoon gig on October 15th in Lake George, NY. Frank dances with a lovely volunteer during FPB's afternoon gig of October 15th in Lake George, NY. Mike is pictured here during FPB's afternoon gig on October 15th at the Adirondack Pub & Brewery. Frank and Fritz are shown here during FPB's afternoon gig at the Adirondack Pub & Brewery in Lake George, NY on October 15th.